I can’t take credit for this one…it was sitting in my mother’s living room when I came to visit. She made it using a combination of this tutorial for making the strip…and this tutorial for sewing it on. The only difference is that she pleated the long (I’m guessing about 7 ft.) scrappy strip as she sewed it to the pillow instead of gathering it before hand. Cute huh? I’m going to try to sneak it into my car tomorrow when I head back home…don’t tell. oh my gosh my jaw dropped and I gasped in excitement! it is absolutely gorgeous!! This is really beautiful. Love the star fabric. love it! what a great scrap busting project, too cute! That is a day brightener! Your mom did a fabulous job! Plan B could be to ask your mom to make you one… 'cause I'm betting she would. Moms like it when you like the stuff they make! That is so cute! I might have to try to make one of those! When I saw this the other day at your guest tutorial I about died. Happiness and Love. I woud want to sneak it into my car too. I am hoping to create one as well. Your Mom is awesome! This pillow is so beautiful I'd sneak it out too. Try carrying it out under a coat! I love it! Especially the chang-up with the pleating! This is beautiful! I love the pleats. Very cute! Thanks for the links to the tutorials…I am going to have to make one of these. Cool that she used your tutorials to make it too. I'm impressed. Wish I had a mom closer that I could steal pillows from. I will have to add it to my never ending list of things to make. 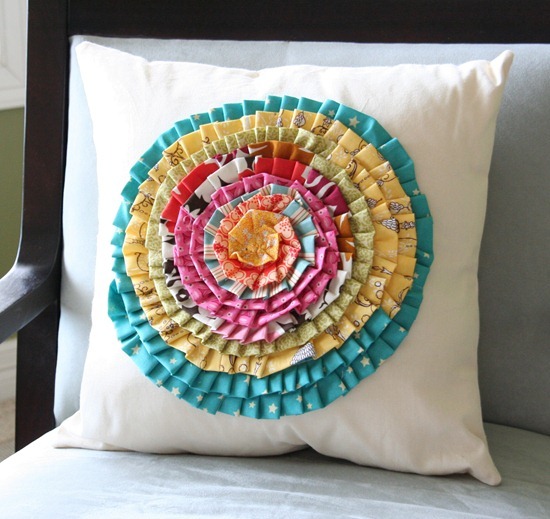 just beautiful, thanks for making me want to make more pillows!!! ahh! And the pleats are just cool! That's a gorgeous pillow. Your Mom did a fabulous job. Mommies are just full of great surprises! It's lovely! What a great pillow. Good luck with sneaking it out of your Mom's house. I'm guessing she'll be keeping an eye on you. Nice!! Would be really nice w/ the scrappy strips done in color graduations – like darkest red on the inside to pink in the middle? something like that. I love it! Oh, that's fab! Wouldn't it look great on the side of a little purse…? I love it! Yet another project to add to my list! Love you blog and quilts! They are amazing. Visiting your page made me think that there are so many quilts I want to try! Seriously cute! I'm glad I stumbled upon your blog today! Hi there, I've just found your blog and love what I've read. I've become a "FOLLOWER" and look forward to visiting often. Ok, that is seriously gorgeous. Your mom must be one cool mama (with great taste in fabric!). What a great pillow….you must have a creative family. Your mom is very clever… i really hope you can get it in the car.. I doubt she will think it was YOU.. hehe! HOLY COW! I don't sew but you make me want to! I want that pillow. I love it. I have a blog but is is lacking in the "sewing projects" post because, well, I don't really sew. I am just starting out but I would love to feature you someday. Let me know what you think. That's great — I love it with the pleats. Oh my stars, that is gorgeous. Love the colors you choose. It is a stunning pillow. WOW! I need to make that pillow! That pillow reminds me of one I had as a kid on my bed.. what a great way to use up all of those strips leftover from strip quilting, I think I got a big bag of those in my fabric cabinet.. thanks, beautiful. wow-whee! that is gorgeous. did i say wow? Just wanted to let you know that I loved your pillow so much that I posted about it on my blog…hope you don't mind.